Place heavier items in the lower part of the carton and lighter items in the upper levels. Be generous with newsprint cushioning; it absorbs shock. Make sure all items are firmly packed in each carton. Loose items may move during transit and cause damage. Do not overfill cartons. Make sure the tops close easily without bulging. Double tape and use PVC or strapping tape to keep cartons from bursting during transit. Use a heavy marking pen. Mark the tops and sides of all cartons. List the general content of each carton, and mark the room each carton should be placed in when it arrives (kitchen, master bedroom, etc.). For items you will need immediately at your new home, mark “LOAD LAST, UNLOAD FIRST”. When appropriate, mark the carton “THIS END UP”. Dish packs (18” x18” x 30”): Double reinforced walls provide extra protection for crystal, glassware, dishes and other fragile items. Large (23” x 23” x 20”): For light yet bulky items, such as pillows, comforters, lamp shades. Medium (18” x 18” x 16”): For non-fragile items such as pots and pans, games and folded clothing. Book (16” x 13” x 13”): Designed for heavier items, such as books and canned goods. Wardrobe (24” x 21” x 49”): For clothing taken directly from your closets. A horizontal metal bar allows clothing to remain on hangers throughout the move. Mirror/Picture: These cartons are adjustable to provide near custom fits for pictures, paintings, mirrors and other large, flat items. Documents pertaining to the sale and purchase of homes. Receipts needed to be reimbursed for travel expenses. 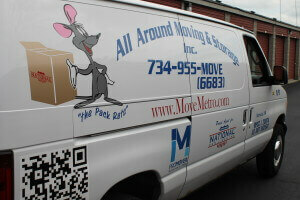 For more helpful packing tips, contact All Around Moving & Storage at 734-941-2280.